The domestic stock markets started the last day of the week on Friday on a negative note. Retreating from its lifetime high, the S&P BSE Sensex dropped 98.32 points or 0.26 per cent to trade at 37,926.05 in opening trade. Banking, PSU, metal, realty and FMCG stocks fell by up to 0.30 per cent. Receding from its record level, the Nifty50 index also slipped 7.35 points or 0.06 per cent to trade at 11,463.35 in early trade. The domestic equity indices opened in red today as global stocks came under pressure after latest geopolitical rigidities. Top laggards in the Sensex pack in opening trade today were Induslnd Bank (-0.05%), Larsen & Tourbo (-0.10%), Maruti (-0.17%), Reliance (-0.24%) and Sun Pharma (-0.81%). Main losers on the NSE index in the morning session were SBIN, Grasim, Axis Bank, Coal India and Bajaj Finance. According to market observers, heavy selling pressure was witnessed in banking, oil and gas and metal stocks. Asia stock markets skidded on Friday amid heightened global trade tensions, while currency markets were whipsawed by a searing selloff in Russia's rouble after the United States slapped on new sanctions, and as economic worries sent the Turkish lira tumbling. Hong Kong's Hang Seng was down 0.40 per cent, Japan's Nikkei shed 0.53 per cent and Shanghai Composite Index fell 0.15 per cent. Stocks of State Bank of India (SBI), GAIL, United Bank are in focus toady as these companies are set to release their June quarter results later in the day. Globally, oil prices also fell on Friday, pulled down by concerns that the escalating trade dispute between the United States and China would stall economic growth and fuel demand. Meanwhile, domestic institutional investors (DIIs) sold shares worth a net Rs. 85.39 crore, while foreign portfolio investors (FPIs) bought shares worth Rs. 370.68 crore on Thursday, provisional data showed. 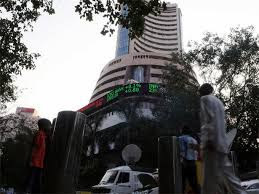 On Thursday, the domestic benchmark indices extended their record-breaking run with BSE benchmark index Sensex breaching the 38,000 level for the first time ever. The Sensex ended at 38,024 while the NSE Nifty settled at 11,470, both record closing highs.